The Telstra Women in Ag Luncheon, now a signature event on the Farm World calendar, provides the perfect platform to not only hear from some inspirational speakers, but also to network and liaise with a room full of energetic, talented women. Patron of the Telstra Women in Ag event, Angela Betheras, winner of the 2011 Victorian Agrifutures Rural Woman of the Year award, initiated this event in 2012 as a way of celebrating the significant contribution that women make in rural and regional Australia, many of whom she met through her award travels. So many fabulous women, none of them famous or holding themselves in high esteem, but each and every one of them a star! They were making huge impacts in their businesses and communities, and through the Telstra Women in Ag lunch, we wish to celebrate them. This year’s luncheon will feature three fabulous speakers who will engage, inspire and motivate you with their personal and professional journeys. Their stories are from the heart and will challenge you to think outside the box, believe in your abilities and provide some real life, day to day experiences – both the trials and celebrations. It’s an afternoon for fabulous networking in a casual and charismatic environment over a delicious lunch and a glass of wine. So, grab your friends, round up your colleagues and book your tickets online now. The Telstra Women in Ag lunch will be held from 12:00 – 2:00pm on Thursday 11th of April. Tickets are $60.00 p/p which includes entry to Farm World, Telstra Women in Ag presentations, lunch, gift bag and a glass of wine or soft drink on arrival. Click here to book your ticket! Melissa Connors, winner of the 2018 Victorian Agrifutures Rural Womens Award, is the grand-daughter of dairy farmers, but that doesn’t mean she knows everything about running her 10-acre property located in Kyneton. In 2011 Melissa, her Husband and then 2 kids made the move from the fringes of Melbourne in search of a ‘simpler’ life. Unknowingly they had taken a major leap into the unknown and learned very quickly that the learning curve they had embarked on was a tough and very steep one. Anything and everything that could go wrong, did just that and Melissa found herself asking time and time again “What do I do?”, “Who do I talk to?”, “Where do I start?”, when one throwaway comment from a retired farmer planted the seed for her project This Farm Needs A Farmer. This Farmer Needs A Farmer connects tree changers with experienced farmers, in many cases retired, looking to pass their knowledge on to those in need and lend a helping hand to the next generation. Walkerville, by the pristine south coast in South Gippsland is home for Amy Paul. She and her husband run their Certified Organic farm producing organic pastured eggs and lamb, growing beef and keeping bees with their 4 school age children. Hailing from Northern California, Amy travelled to Australia to study the beef industry and visit farming families from far north Queensland to Victoria. Naturally at home in deep conversation over the kitchen bench, her insight into rural Australian life became clear. A good life is about people power and connection. Twenty years later, community and connection have naturally become priority for Amy and her family. 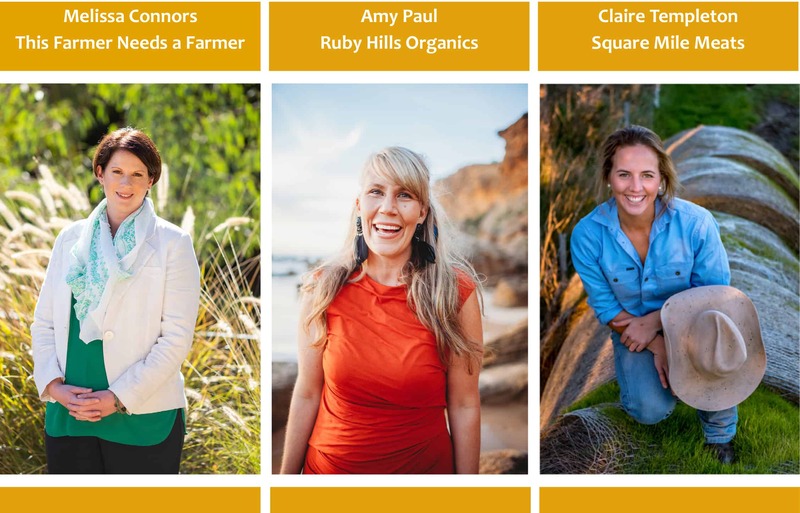 In April 2017 The Invisible Farmer project curated by Museums Victoria featured Amy amongst other fine farming women in agriculture, as a way of strengthening the bond of often overlooked females in this crucial part of our economy and community. Passionate advocate for community connection and activism, Amy works within a multitude of local initiatives from her Boardriders club to organizing women’s circles and community singing groups to activism on Climate Change and the Coal seam gas ban. This advocacy for Amy takes place whilst running the farming business alongside her husband, marketing her farm products, and learning along with her children and community about what it takes to be a thoughtful and dynamic human. Navigating political agendas and natural disasters fortify her passion about action on climate change, human rights and looking after our farmers. Cultivating female energy and supporting loving friendships is a critical point for Amy. She is frequently supporting and creating spaces for women to congregate and support each other. Compelled to always take a stand against the status quo, Amy will spark thought about your contribution to your community, country and planet. Growing up in the heart of the Gippsland Region, Claire is a sixth-generation farmer with a passion for primary production and holds a degree in Animal Science from Charles Sturt University, Wagga Wagga. Over the years, and to pay her way through university, Claire worked extensively throughout many facets of Australian Agriculture including both the grain and wool industries of New South Wales, as a chaser bin driver and roustabout in shearing sheds. Claire also had the opportunity to work at Marion Downs, a cattle station in outback Queensland which was a grower property for NAPco. All of these jobs were so eye opening and rewarding for her to learn, develop and really cement the fact that she wanted to go home and continue working on advancing their properties. Enter Square Mile Meats! The name Square Mile comes from Claire’s connection to the small community of Maryknoll. Claire’s grandparents were part of the original group to establish the town in West Gippsland in the 1950’s and three generations of her family have since enjoyed living there. Maryknoll was mapped out on an area of a square mile. “I believe in producing and selling only the finest meat and I know that the finest meat comes from animals and land that are well cared for. I have been lucky enough to be able to come back to our family farm after university and together with my parents, run a beef and dairy operation. It’s a high rainfall area with rich, heavy clay soil making it the ideal environment to produce grass fed, hormone free beef.” Claire just loves farming and couldn’t see herself anywhere else!